SMC products support efficient automation for food processing and packaging appilcations. They feature hygienic and environment resistant designs, with energy savings and safety in mind. Water resistant version of the standard double acting, single rod version of the CQ2 compact cylinder includes a rod wiper to prevent moisture from entering the actuator. The CQ2 is available in bore sizes from 20mm to 100mm. It comes standard with male or female piston rod threads. It is possible to mount auto switches on any of the 4 surfaces. The IP8000 E/P positioner is more compact than the IP6000 with improved visibility of the pressure indicator. Other features include an improved enclosure protection IP65, interchangeable mounting, excellent shock and vibration performance, and a 1/2 split range available by simple span adjustment. Air shocker is a pneumatic piston type shock generator. Removes plugging due to bridging or adhesion of bulk material inside a hopper or chute. Filter – regulator – lubricator combinations with external epoxy coating of metal surfaces for use in aggressive or washdown environments. Series KP are one-touch fittings for clean room blow-off systems and drive air systems. The KP series is completely oil free and liquid-contact areas are non-metallic. Parts are cleaned, assembled and double packaged in a clean room. Resin parts for one-touch series KPQ/KPG (for drive system air piping) are polypropylene. Series CJ5-S is a small bore stainless steel cylinder, designed for use in environments with water spray (such as food processing machines). A special scraper (standard) prevents water from entering the cylinder. Non-toxic additives allow confident use in equipment for food, beverage and medical products, etc. The CJ5-S series can be disassembled for replacement of seals. The ZH-X185 is versatile and can function either as a blow off unit or a vacuum unit depending on the direction of the output port. There is only one supply port and with available mounting brackets, it is very easy to install. Direct air and solenoid operated 2 and 3 port valves can be used with a wide variety of fluids. The manifolds are available in a common SUP style or individual SUP style (for vacuum use). The VXA31/32 series manifold is individually ported. Valves for both are easily replaced without changing existing piping. VFN2120N-X36 is a hygienic solenoid valve with standard NAMUR interface. The valve PPS resin body provides excellent high temperature and chemical/corrosion resistance for use in wash down applications (IP67). The 5-pin M12 electrical connections is used for water proof sealing. With power consumption of only 0.5W, it is the most energy efficient valve with NAMUR interface in the market. It can also be used with AS-i bus system. VFN2120-X36 is available for 24 VDC or 110 VAC operation. S coupler series KK employs a unique connection method. A slim body design and large effective area are achieved with a construction that does not use steel balls or valve springs and therefore does not restrict the flow path. Together with a reduction of the body size, pressing parts and resin parts are used to achieve an overall weight reduction. The SY5000 is a clean-style valve manifold developed for the food & beverage industry. It is IP69K rated for washdown and cleaning. It offers the ability to install valves outside of a protective panel and close to actuators for better control. The application benefits from a small, lightweight package that is easy to clean and maintain. This next generation ISE70 pressure sensor provides continuous quantitative values, as well as switched digital outputs when pressure set points are met. This sensor is also IO-Link compatible. Sensor information, such as identity, functional state, cable connection, and current or switch values can be set or monitored remotely though an IO-Link master, and connected to a fieldbus network. The ISE70 is designed for abusive environments that may also include splashed coolant, lubricants or grime. Electronics are packaged in a metal housing, while the piping connection is a stout lug with female threads, which together protect the sensor against accidental collisions with other objects in the area. A smooth display face with membrane type buttons avoids contamination from grit and sticky residue that could clog or jam raised rubber buttons. The display is angled and can rotate 336 degrees, to permit easy reading when indirectly mounted. The main screen shows instantaneous values in red or green, while the sub screen setting appear in orange. Switch indicators will also light when set points are reached. The MPC is SMC's low cost Ethernet positioning cylinder. 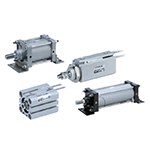 The MPC series offers a cylinder, solenoid valve, linear positioner, and controller in one package. With its integral position control, the MPC needs only power and Ethernet input signal. The target position is kept by opening and closing solenoid valves controlling pressure on the cylinder. The MPC has an output signal to give position feedback to a customer's controller. Standard ball bushings protect against side load.. 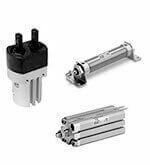 The MGPM-X2532 is a compact guide cylinder with external stainless steel construction. It features improved corrosion resistance in environments exposed to water over the standard and -XC6 variants of the MGPM series. The specialty regulator series VBA is a booster regulator that saves money and energy by increasing the main line pressure up to two times. The booster regulator, when connected to air supply line, increases pressure up to two times and the main air supply pressure may be set low. Desired pressure increase can be easily adjusted. Series AM can separate and remove oil mist in compressed air, which is difficult to remove by ordinary air filters and removes solid particles such as rust or carbon of more than 0.3 micron. It is the most suitable for air sources that drive pilot, metal seal solenoid valves. Series VMG has a large effective area of 0.05in² (30mm²), without nozzle. Pressure loss is 0.725psi (0.005MPa) or less when nozzle bore size 2.5mm is used. Piping direction is optional from the top or bottom. Available nozzles include: male thread; high efficiency; low noise w/male thread; and extension nozzles. Accumulated static electricity causes problems in the manufacturing environment. Plastic wrap, foam packing, or labels cling and attract dust and dirt, causing misapplication or contamination. Excess static charge damages sensitive electronic components. Even comfort and safety of personnel can be compromised. The C85 series conforms to ISO 6432 and CETOP RP52P. The C85 is available in bore sizes 8mm through 25mm with standard strokes ranging from 10mm through 300mm. A unique rod packing design prevents entry of dust and the effectiveness of the seal is such that the C85 is suitable for use in extremely dusty environments. With abrasion resistant packings and replaceable piston rod seals, the C85 offers exceptional service life. The ZK2 series is an energy-saving generator with 90% reduced air consumption. It has a 50% increase in suction flow compared to other single stage SMC generators. With its compact size and light weight, it is easier to maintain. The ZK2 also has various mounting options to choose from. Vacuum pad and generator are integrated for space savings. The two-stage generator increases suction flow up to 50% and reduces air consumption up to 30%. Design features allow for daisy-chain piping and the mounting with lock plates makes for easier maintenance. 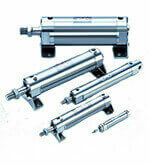 The CQ2 compact cylinder is the world's best selling pneumatic cylinder and can be supported globally. The CQ2 is available in 15 bore sizes from 12mm to 200mm. It comes standard with male or female piston rod threads. 42 standard options make it one of the most versatile cylinder series on the market. For mounting flexibility, it is possible to mount auto switches on any of the 4 surfaces. Vacuum Generator series ZL series is a multi-stage, high-efficiency vacuum generator, which operates at 150% efficiency (compared to about 40% for other units). For each scfm of compressed air it consumes, the ZL generates an incredible 1.587 scfm of suction flow. The ZL is available with a built-in vacuum switch with digital readout for design flexibility. Other features include built-in suction filter, exhaust silencer, and one-touch tube fittings. Its' compact design allows for mounting from three sides. The EX600 serial interface offers a full suite of diagnostics and programmable parameters to meet the most stringent requirements. The EX600 offers excellent flexibility including digital input, digital output and analog input unit options. With the use of D-sub output blocks, a maximum of 9 remote D-sub manifolds can be attached to one EX600 communication module. This serial interface is compatible with series SV1000/2000/3000, VQC1000/2000/4000, S0700 and the new SY series valves. Available protocols include Ethernet/IP™, PROFINET. The EX600 wireless cannot be used in countries where wireless is not supported. Refer to the catalog for details of countries where wireless is supported. SMC's hygienic design cylinders, series HY, offers significantly improved water resistance by adopting a new lubricating construction. The cylinder's flat configuration (grooves for auto switches and holes for cushion needles, etc. have been eliminated) allow the surface to be wiped off easily. High purity fluoropolymer tubing is available as standard in metric and inch sizes. These series has outstanding corrosion resistance, compatible with chemicals such as acids, bases and ultrapure water. The ZP3P series suction cups are made of a silicone rubber that is compliant with FDA21CFRSS1772600. The blue colored pad can be easily distinguished during contamination inspections. The sealing skirt design reduces leakage and offers a better sealing performance for this film. Also incorporated into the design is a stopper support in the center to help wrinkle prevention on thin work pieces during adsorption. SMC has a range of standard, made to order, and specialized cylinders with a combination of stainless steel construction, water resistant seals, and special rod scrapers designed to prevent corrosion from exposure to water or coolant. Pneumatic components used in a dusty environment require a different design mindset. The designs must incorporate a method of sealing the dusty outside from the internal pneumatic components as well as limiting electrical and thermal energy. Static electricity control is also a consideration in bulk and powder applications. SMC has products that are specifically designed to be used these types of applications. The VQ20/30 series is a pilot operated, two port multi-media valve. The series is compact and lightweight with a large flow capacity. The VQ20/30's long life, high speed coil (up to 20 million cycles at 100cps for pneumatic use) along with its all plastic construction make it an excellent choice for those who want high performance at a lower cost. With the release of the KN series nozzles and gauge heads 30~90% of air consumption required for the current nozzle operation can be saved with the appropriate selection of the new nozzle and sizing. Many variations of nozzle are available with tube materials including nylon, soft nylon, soft copper pipe and OST tubing. Sizes range from 4mm-20mm. SMC offers a range of products comforming to the ISO13849-1 safety standard, categories 2, 3 & 4. Redundant systems can be easily constructed to ensure safe and robust operation. Series KE pressure relief valve with one-touch fitting can release residual pressure from a cylinder to the atmosphere by the push button. The two types of available piping are the one-touch fitting type and the Rc(PT) screw type. SMC has numerous solutions for load drop prevention. End lock cylinders lock and hold the load at the end of stroke. Locking cylinders have the ability to lock a load anywhere within the stroke. Series ASP is a speed controller with an integrated pilot check valve. This combination makes it possible to control cylinder speeds and permits temporary intermediate stops. 5-port solenoid valve combines the double check block with a 3-position exhaust center solenoid valve will enable the cylinder to stop in the middle of maintain its position for long periods of time. Series AVL adds lock-out capability to the basic AV series design to permit safe servicing of the equipment once the pneumatic supply has been shut off. The red button on a safety yellow body aids in identifying the valve as a pneumatic disconnect. It is available with multiple operating voltage choices as a manually operated valve with no power requirements.